One texture that has caught my eye and I plan to add to my closet this season is tweed. Up until recently, I overlooked the woven fabric and how versatile it really can be. I think I had the mindset that it is was only for professional purposes, a bit stuffy and reminded me of Cher from Clueless (not that I haven't watched that movie hundred times). Tweed never seemed to fit my style, until now. It all began when I randomly popped into Old Navy a couple of months ago and found a jacket on mega clearance. I decided it would be something different for the fall and would be fun with distressed denim and heels. So, I scooped it up and brought it home. Now I am just tapping my toes until it's cool enough to wear it. After that purchase, I never turned back and all of a sudden I began to notice more pieces in stores, primarily blazers and cropped jackets. Because this is a top trend for the fall, brands have expanded their tweed horizons and designed pieces that are functional, fashionable and go well beyond the houndstooth days. I was pleasantly surprised to find a quilted tweed vest from Old Navy as well as a moto jacket for an unbelievable price at Target. With the regular sales that J.Crew Factory has been running, this pencil skirt is something I am hoping to add to my closet soon. If you follow me on Instagram, you may have noticed that I have lately been a little obsessed with pairing leather and lace. But as soon as the temperatures drop, I believe that my lace will have a some serious competition and my leather is pretty excited about it. I'm also loving this trend - great texture and colors! I am all about tweed for fall and have been on the hunt for a moto jacket in tweed - loving all your picks here! I am LOVING the whole tweed trend, but I haven't added anything to my closet yet. You've just given me lots of great options!!! Tweed is fun! But looks itchy, haha. I do love those tweed loafers though! I love tweed! I agree, it definitely gives off a professional vibe, which works out quite nicely for my work wardrobe. I haven't purchased any informal tweed yet for weekend styling, but I'm open to trying it out! Those tweed flats would be perfect on the weekend. I need that quilted tweed vest! And your eye first file of course! A big YES to tweed. So regretting getting rid of my Chanel style jacket some years ago. The vest is now on my wish list. I've always been & will always be a fan of tweed....love its rich textures & your picks here are superb! I love tweed, I think it's such a classic material. I have a tweed skirt, but I totally would love a tweed jacket of some sort! I'm happy this trend is in because I'm already got a tweed jacket in my closet. :) That tweed vest is SO cute! Isn't it funny how all of a sudden we are pulled into something and then before we know it we can't get enough of it!? This has happened to me more than once. I am loving the tweed!! I want that pencil skirt! I've always loved the preppy vibe that tweed has–but I don't wear it nearly enough! I'd love a top in tweed to add to my closet this fall! I am loving that tweed vest! I have been thinking I need to add some tweed to my wardrobe lately, The post practical item for me would probably be that pencil skirt; it would be perfect for work!! I have a tweed skirt, so I am totally ahead of the game! Love tweed, and I have a perfect tweed dress that will get use once baby comes and I can wear normal clothes again! The black tweed vest might be in my shopping cart right now. I love tweed. I found an awesome JCrew-esque pink tweed skirt at Goodwill last year and I wore it to death last spring. Such a great fabric, but I'm really loving those flats you found! How cute. OBSESSED with #4!!! :) looove tweed. I love tweed!! Tweed & leather are a must have in my book for Fall!! 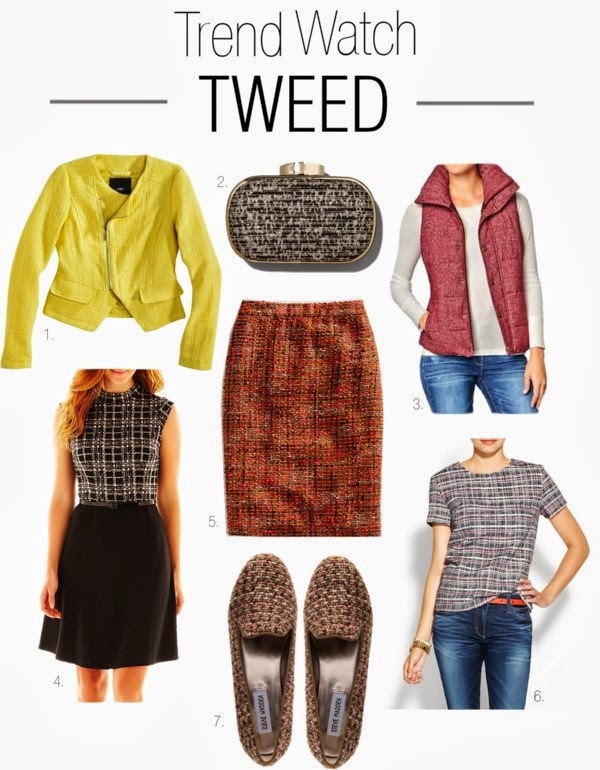 I love tweed for fall! I am especially loving all of the different color tweeds. I just got the tweed front tshirt from J. Crew and I am kind of obsessed. Now I want a tweed pencil skirt! I so love that middle tweed skirt! I LOVE tweed! I have a tweed moto jacket from H&M and I just bought a cute short sleeve tweed shirt from JCrew. And I cannot believe that vest is from ON...might need to add that to the closet this winter! That yellow moto jacket is perfection! Love that skirt! The colors are perfect for fall! I seriously want ALL of these!! Great picks! I love tweed. I need some tweed! A tweed shirt would be super unexpected and fabulous. I have loved tweed since I was a kid! It's so weird. You think of librarian skirts or something, or professors jackets but it is such a great fabric. I have always loved tweed...my problem is letting it go once the weather warms up!